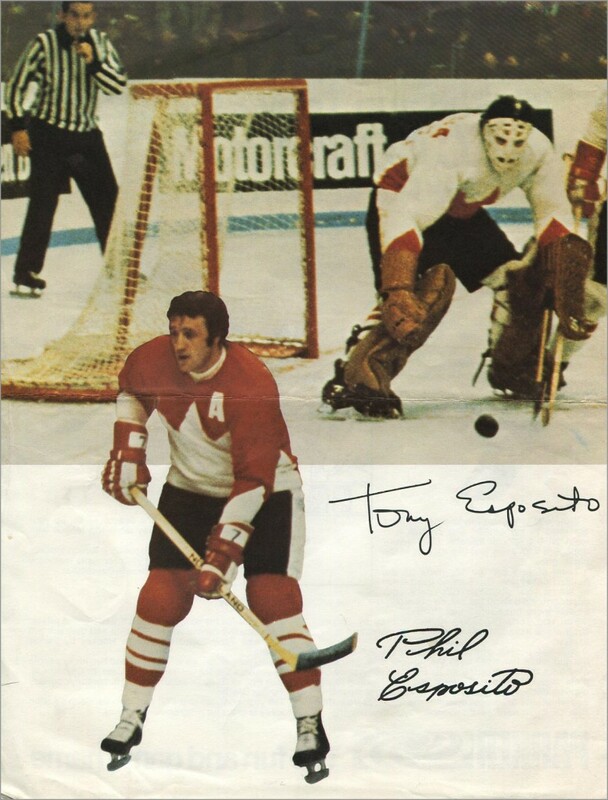 I found this picture of Phil Esposito and Tony Esposito in a pile of old sports memorabilia at a card show a few years back. 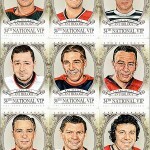 It shows the famous brothers playing for Team Canada in the 1972 Summit Series, along with facsimiles of their autographs. 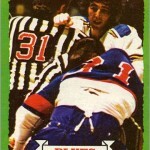 On the flip side is an advertisement for a tabletop hockey game they endorsed. 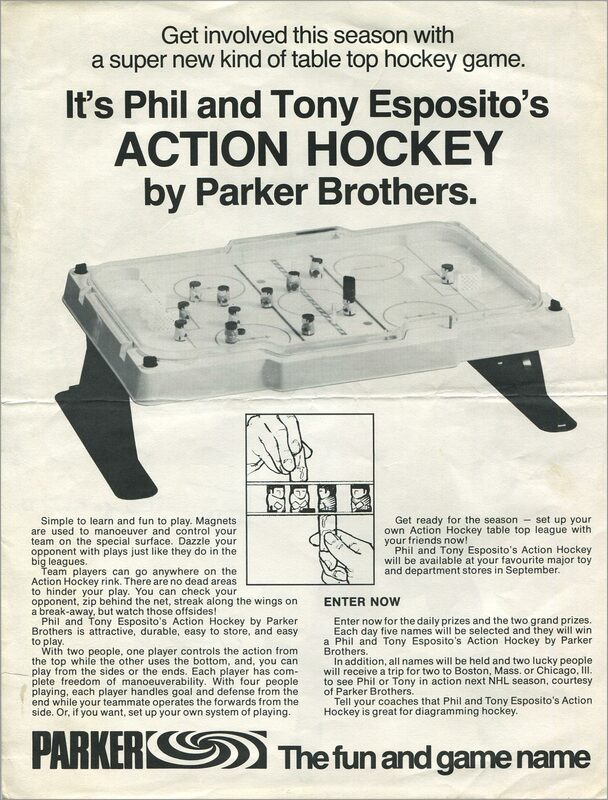 Phil and Tony Esposito’s Action Hockey was made by board game giant Parker Brothers (makers of Monopoly and Risk) and released in 1973. 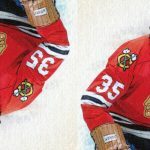 What made this different from other tabletop hockey games is that it used magnets instead of metal rods to control your players. 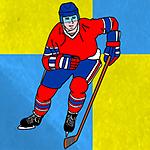 Using magnets to move the hockey players around was an innovative idea, as the players can go anywhere and you could knock into your opponent’s players. However, whoever controls from the top has a distinct advantage; they can see what they are doing, and the physical mechanics of moving your arm outward is usually easier with an overhanded grip. Don’t believe me? Just watch how the “overhanded kid” beats the “underhanded kid” in the commercial for this toy. According to the print ad, Parker Brothers held a contest, with two grand prizes: “a trip for two to Boston, Mass. 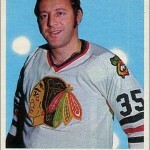 or Chicago, Ill. to see Phil or Tony in action next NHL season.” I wonder if winners got to pick which city they went to. i forgot that i had one of these, until your story jogged my memory, sal. my favourite feature was the way it introduced body contact to the table game — you could take long runs at your opponent. but i didn’t find the game to be as fast as depicted in this commercial — i see now that, even in the early ’70’s, production people had figured out that tight editing can make the game appear faster than it truly is. thanks for sharing. I thought I had given our game to my son for his kids, bit he says “no”. I can’t find it. How can I get one? I have one of those! Are you still looking for it?? Didn’t see this until just now, a year later! 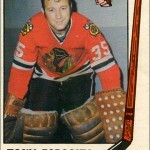 Do you still have it? Is it in good condition?